When we think of mazes we think of getting lost and confused. But curiously, mazes were not originally meant to fool or bamboozle you. That was the job of Labyrinths. You may recall that one of those was the favourite stomping ground of the Minotaur and that it was only a ball of string that helped the hero avoid coming to a gory end! Mazes were actually designed to help people meditate in a quiet and structured manner. In the fourteenth and fifteenth centuries they were thought to be the ideal place to go to do some positive thinking or to reflect on the events of the day or week. Monks and nuns and prayerful people would wander along the structured route and focus on their devotions. In fact the maze at Hampton Court Palace was the first one to introduce the idea of dead ends and blind alleys. Until that time you simply had to follow the direction of the maze as you worked your way through your rosary and generally made atonement for being a bad person. But that just wasn’t enough for the designers at Hampton Court, who decided that they should introduce a few more hazards; and so in around 1690 they set out to “improve on the one that had been there beforehand. There are all kinds of hints and tips about mazes, but the place seemed so compact that we didn’t bother to mug up on them beforehand. Instead we simply launched into the twists and turns happily. After all it couldn’t be too difficult. For goodness’ sakes there were parties of school kids ahead of us and they were happily running on at high speed. 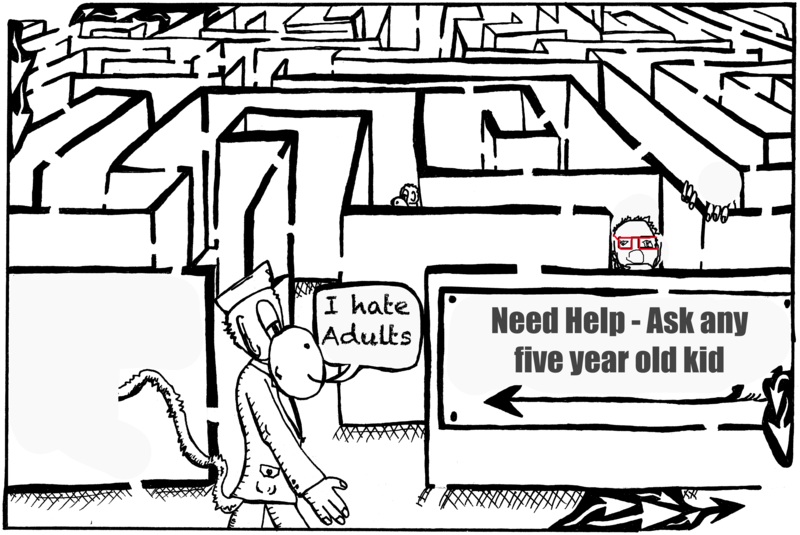 It was only fifteen minutes later when the same gaggles of schoolchildren passed us in the opposite direction for the fourth time that we realised that there might be a little more to this maze thing than we had realised. A further fiftten minutes later we were definitely getting close to the centre because we could hear the excited high pitched voices of the children delighting in finding the middle. I nodded weakly and tried to cast my mind back to the clues about maze running. “I think you have to take every right turn you come across,” I finally suggested. And so we duly followed this trick for another ten minutes. I was clearly not the best maze navigator in the world. That however, was when we found our saviour, or should I say Saviours! The same gang of school kids from an inner city primary school who had been whistling past us time after time suddenly emerged once again. We followed a couple of them whilst the rest went haring off to find poor little Ibrahim. And within three minutes there we were at the very centre of the maze. The maze attendant looked at us with a pitying smile. “Did the children finally rescue you?” she asked. We said nothing and looked slightly sheepish. At least we weren’t the worst of the maze runners that day!